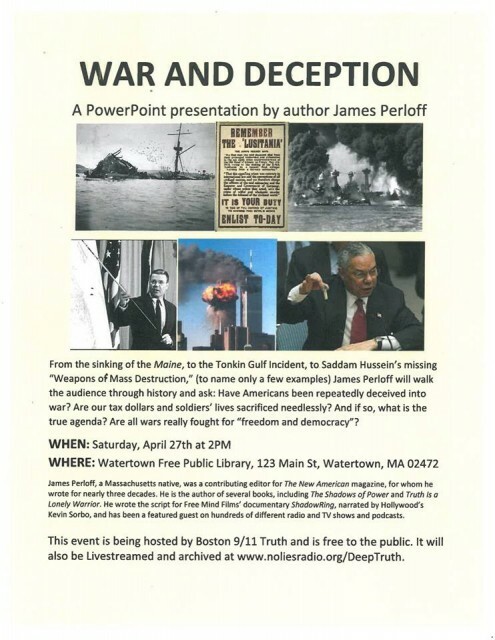 From the sinking of the Maine, to the Tonkin Gulf Incident, to Saddam Hussein’s missing “Weapons of Mass Destruction,” (to name only a few examples) James Perloff will walk the audience through history and ask: Have Americans been repeatedly deceived into war? Are our tax dollars and soldiers’ lives sacrificed needlessly? And if so, what is the true agenda? Are all wars really fought for “freedom and democracy”? James Perloff, a Massachusetts native, was a contributing editor for The New American magazine, for whom he wrote for nearly three decades. He is the author of several books, including The Shadows of Power and Truth Is a Lonely Warrior. He wrote the script for Free Mind Films’ documentary ShadowRing, narrated by Hollywood’s Kevin Sorbo, and has been a featured guest on hundreds of different radio and TV shows and podcasts. This event is being hosted by Boston 9/11 Truth and is free to the public. It will also be Livestreamed and archived at www.noliesradio.org/DeepTruth. Wayne Coste is the 9/11 TAP Events Page Manager for this event. is the for this event.